This is a mini review post in conjunction with the read-a-long hosted by Bree @ 1Girl2ManyBooks. 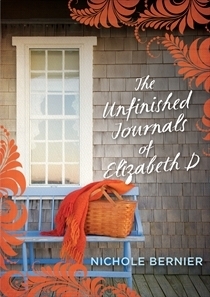 We’ve read the first third of the book, The Unfinished Journals of Elizabeth D by Nichole Bernier. Disclaimer: This post will include spoilers for the first part of the book, as does Bree’s post. I’ve dropped by Bree’s blog to join the discussion, but I thought I’d share my initial thoughts here too… a bit like a journal entry for a book about journals! My thoughts: After reading the first chapter, I felt a bit lost, I wasn’t sure which character belonged to which family or who was partnered with whom. But the moment Dave tells Kate about what he read in the journals while he talked to her in the kitchen- I was hooked. I too have kept journals since I was about 12 (when I started high school), though it has been a couple of years since I have written an entry. I do occasionally write something down on a scrap piece of paper and tuck it away if I have something weighing on my mind. Once something is down on paper, it’s external from me and I can think more clearly- it helps me make sense of my feelings. What would I want to happen with my journals if I was no longer here? That’s a tough question but perhaps something I should consider seriously! I have a box tucked away with old letters and journals and I can’t imagine who I would want to have access to them. I think my ambivalence mainly stems from the fact that the only time I write consistently in a journal is when I’m experiencing intense feelings- anger, grief, frustration- that I need to get out of me, I need to offload. Particularly as a teenager, I wrote many angry entries about family issues and if anyone was to read over those they would probably think I was one messed up kid! I can completely understand both Kate and Dave’s fascination with the journals. Aren’t we all curious beings? Having access to someone’s most innermost and unfiltered thoughts would be so intriguing. Though, I think Kate is weighed down with both the ‘privilege’ of inheriting the journals whilst also feeling burdened by the consequences of such knowledge. I do feel sorry for Dave; he has lost his wife and what a wonderful opportunity it would be for him to connect with her again- only the journals weren’t left for him. And his curiosity in reading her final entries has left him feeling hurt and betrayed. To be honest, if I was in Kate’s position I probably would wait until I’d read all the journals to decide what to tell him, just as she has indicated she will do at this stage. I am finding it difficult to connect with Kate and I think that’s partly due to her flat affect and the uncertainty in where this is coming from- her grief about losing Elizabeth, the stalemate her marriage has reached or sense of purpose in life (she’s a great cook but has delayed returning to work). The read-a-long continues over the next two Wednesdays, so I’ll try and post more of my thoughts here then- or perhaps do a final review at the end. Synopsis: Summer vacation with her family was supposed to be a restorative time for Kate, who’d lost her close friend Elizabeth in a plane crash. But when she inherits a trunk of Elizabeth’s journals, they reveal a woman far different than the cheerful wife and mother Kate thought she knew. Written with grace, depth, and honesty, this is a story of two women – their friendship, their marriages, private ambitions and fears. And what they chose to keep hidden.